I gotta be honest, I'm having a tough time writing this review, because everytime I look at these boots, my brain just goes "SQUEEEEEEEEEEEEEE!" 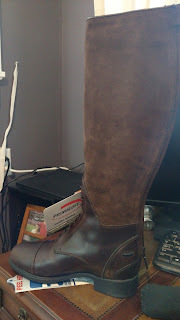 I have publicly documented my winter boot struggles on this blog. I had a pair of TuffRiders that I paid $50 for that lasted two years, and I had a pair of fancier TuffRider's that basically lasted 3 weeks. After last year, I was done with buying cheap winter boots that don't last. I wanted to get a good pair that I loved and that would last many years, not a cheap pair that would get me by for one season before getting thrown away. 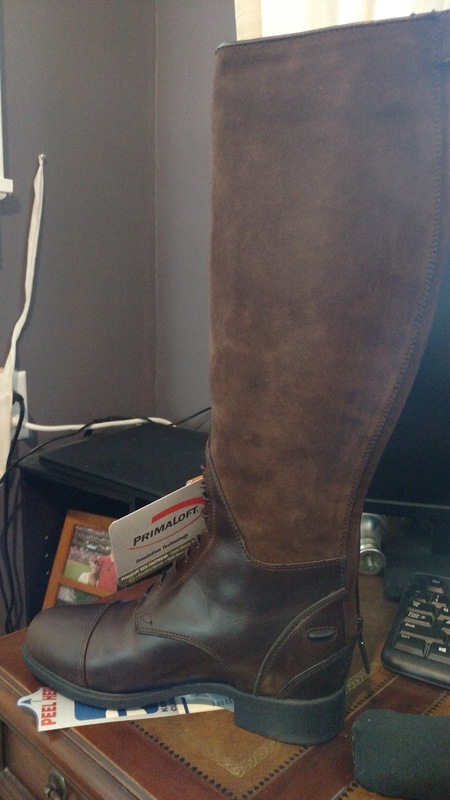 None of the surprisingly limited options really revved my engine until I was browsing foreign eBay and saw that Ariat made the Bromont Pro H2O in brown in the UK. Oh. My. God. GRABBY HANDS. (Also that is a nearly invisible reflective strip glowing at the bottom, illuminated by flash). 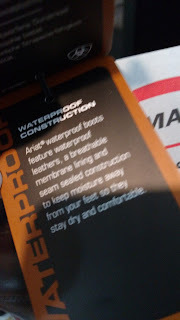 This isn't a full product review because it's hot outside and I can't test them yet, but I wanted to get the word out about them in case anyone else wanted to get some. Fair warning, they're on clearance (which means they're cheap) and apparently being discontinued (which means sizing options are limited). I paid 149 GBP ($198) + 79 GBP shipping ($105) or $303 total, which is $46.95 LESS than I would have paid for the same thing in black from Smartpak. And I wouldn't be nearly as in love with them if they were black. - I wear a 6 slim in Ariat field boots and bought a 7 full in these to account for fluffy socks and breeches, and that was the right call. I could even have done a 7.5, since with my absolute fluffiest deer hunting socks the foot is a bit tight. The calf is perfect with my winter standard of Underarmour 4.0, fluffiest deer hunting socks, and Irideon winter tights. 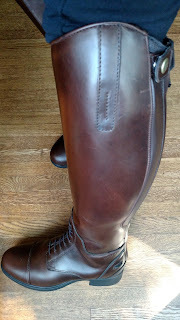 - All that standard Ariat stuff: nice quality leather, spur rests, ATS footbed. I take good care of my Ariat paddock boots, and they reward me by lasting for years. 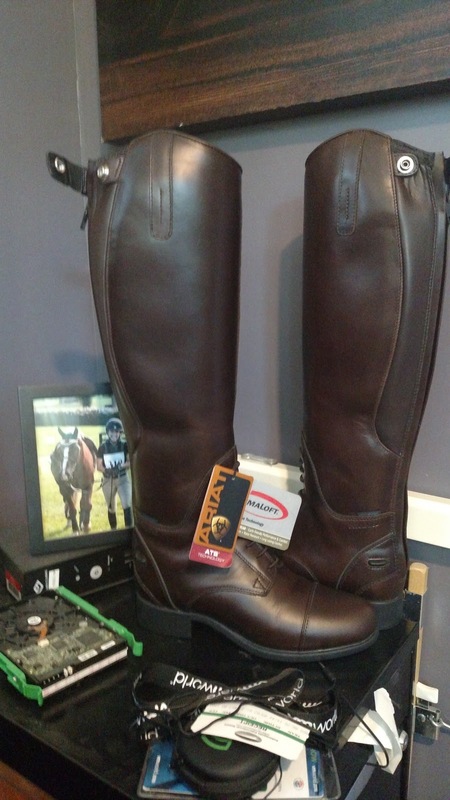 Plus when every part but the leather wears out, they can be professionally redone by NuShoe using official Ariat parts, which I have had great experience with and highly recommend. - Not sure if I'll like that suede inside panel, but that's a standard Bromont thing and people seem to rate them highly, so I guess it'll be okay. - They are tall, and should drop and fit nicely eventually, but they're over half my kneecap out of the box. Here is a link to the eBay seller I bought them from: Thomas Irving Equestrian Superstore: CLEARANCE Ariat Bromont Tall Insulated H2O Riding Boot - Waxed Chocolate. Note that if you are in the US, you have to commit to buy them, then message the seller to ask for an international shipping quote, then pay the invoice he sends you. I ordered mine on a Friday, and they arrived before I got home from Vegas the following Friday, so shipping and turnaround was super fast for an international order. Okay, anyone else going to be buying a pair of these? Like I said - LOVE!! Me too, so much more than I would if they were black, haha. My 8 year old Bromonts have the suede panel, which at this point has rubbed to be shiny. It never bothered me, but nor did it particularly offer any mind-blowing benefits. It's just sort of there. I got used to it after a while and it did have the side benefit of making the calf area overall more flexible. I'm glad to hear they've lasted you that long and the suede hasn't been an issue. I'm gunshy about weird materials in winter boots after I just could not get those TuffRiders to look clean no matter what I did. Ha. Ha. Although I start wearing my winter boots around 50-55 degrees, so...? Haha. I think I'm cold blooded though. I'm really really really lucky they don't have my size. Er. I mean, my wallet is really really really lucky. Me, not so much. Pout. But like, I totally saved my wallet $46.95. Right? I only wanted one but it was buy two get one free and that's a good deal so I technically saved money right? Right???? 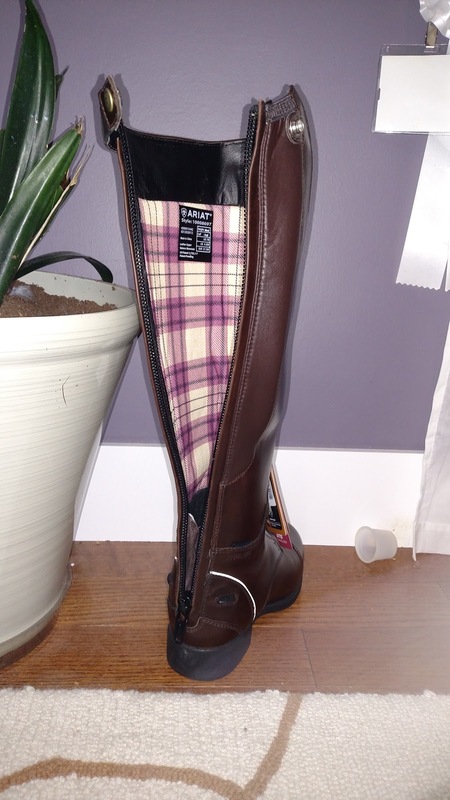 I have a pair of effingham dressage boots in brown that might fit you. Pull ons though but pretty cheap. Those look really pretty. Thankfully it' not cold here so I just wear the same thing year round. Oh man, I'm looking for a winter tall boot right now, and may need to consider the Bromont... although the suede panel is strange to me. You'll have to update us after you've ridden in them!! That's really good to know all the way around, thanks for sharing all that!